Is this potentially harmful oil lurking in your favorite healthy restaurant dish? As if you needed another cooking oil conundrum to contend with, right? 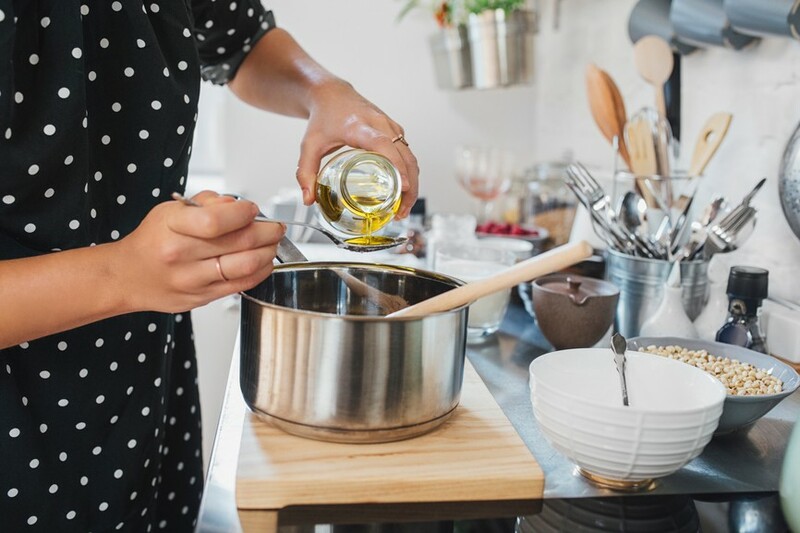 Well, according to brain health expert Max Lugavere, grapeseed oil is another one that you should put on your watch list, since it’s extra-high in potentially inflammatory omega-6 fatty acids. “A lot of the problems associated with Western diet are thought in part to be because our omega-6 to omega-3 balance is so skewed toward omega-6s, which provide the precursors to our bodies’ inflammation pathways,” he says. Is this truly a concern, however—or merely more nutritional fake news? Keep reading to find out whether you should avoid grapeseed oil while cooking at home and dining out. “It’s thought that for the vast majority of our evolution, we were consuming [omega-3s and omega-6s] in a ratio that was 1:1 or maybe 1:4 in favor of omega-6s, but definitely not the 1:25 ratio—or more—which people today are consuming,” adds Lugavere. With all of that said—and here comes the confusing part—the verdict on grapeseed oil is not definitive. Some studies have found it to have beneficial effects on human health; however, even then, “excessive supplementation” is cited as being pro-inflammatory. And know that there’s a way to counteract the effects of an unintentional omega-6 overdose—simply up your omega-3 intake whenever possible. Studies have shown that those who consume a Mediterranean diet, which offers a better balance of omega-3s to omega-6s than typical Western diets, have a reduced risk of cardiovascular disease. Bring on the mezze plates. Here’s how to sneak more Omega-3s into your diet for balance—just beware of fake supplements.